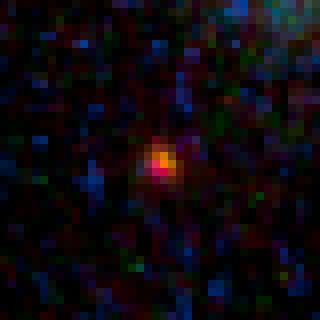 This close-up view shows the galaxy MACS0647-JD, the farthest object yet known, as it appears through a gravitational lens imaged by the Hubble Space Telescope. The galaxy is 13.3 billion light-years from Earth and formed 420 million years after the Big Bang. The Hubble Constant is the unit of measurement used to describe the expansion of the universe. The cosmos has been getting bigger since the Big Bang kick-started the growth about 13.82 billion years ago. The universe, in fact, is getting faster in its acceleration as it gets bigger. What's interesting about the expansion is not only the rate, but also the implications, according to NASA. If the expansion begins to slow down, that implies that there is something in the universe that is making the growth slow down — perhaps dark matter, which can't be sensed with conventional instruments. If the growth gets faster, though, it's possible that dark energy is pushing the expansion faster. As of January 2018, measurements from multiple telescopes showed that the rate of expansion of the universe is different depending on where you look. The nearby universe (measured by the Hubble Space Telescope and Gaia space telescope) has a rate of expansion of 45.6 miles per second (73.5 kilometers per second) per megaparsec, while the more distant background universe (measured by the Planck telescope) is a bit slower, expanding at 41.6 miles per second (67 km per second) per megaparsec. A megaparsec is a million parsecs, or about 3.3 million light-years, so this is almost unimaginably fast. The constant was first proposed by Edwin Hubble (the namesake for the Hubble Space Telescope). Hubble was an American astronomer who studied galaxies, particularly those that are far away from us. In 1929 — based on a realization from astronomer Harlow Shapley that galaxies appear to be moving away from the Milky Way — Hubble found that the farther these galaxies are from Earth, the faster they appear to be moving, according to NASA. While scientists then understood the phenomenon to be galaxies moving away from each other, today astronomers know that what is actually being observed is the expansion of the universe. No matter where you are located in the cosmos, you would see the same phenomenon happening at the same speed. This graph illustrates the cepheid period-luminosity relationship, which establishes that if you know the period, or timing, of a cepheid star's pulses, you can determine its intrinsic brightness. By comparing intrinsic brightness to observed brightness, you can determine the star's distance, because it dims as it moves farther away. These distance measurements were used by the Spitzer telescope to measure the expansion rate of the universe more precisely than ever. There are many kinds of variable stars, but the one that is most useful for measuring the Hubble constant is called a Cepheid variable. These are stars that regularly change their luminosity on a scale that usually ranges between 1 and 100 days (Polaris is among the most famous members of this group). Astronomers take distance measurements of these stars by measuring the variability of their luminosity. The brighter the Cepheid appears from Earth, the easier it is to measure it. Some Cepheids can be seen from the ground, but for more accurate measurements, going into space is the best bet. While Edwin Hubble was able to measure Cepheids about 900,000 light-years away — an astonishing distance for the time — within the universe that is still relatively close to Earth. Farther in space, the Cepheids are fainter and recede more quickly, which is where the Hubble Space Telescope was able to help in the 1990s after its launch. In 2013, the Gaia space telescope launched to accurately map the positions and luminosities of approximately 1 billion stars. Its data releases have also helped with refining the Hubble Constant. Cepheids, however, are not perfect for measuring cosmic distances. Among other difficulties, they are often located in dusty areas (which obscure some wavelengths in photographs) and the more distant ones are hard to spot because they are so faint from our perspective. Other techniques arose to supplement Cepheid measurements, such as the Tully-Fisher relation, which is a correlation between the luminosity of a spiral galaxy and its rotational velocity, according to Shoko Sakai, a research associate at the National Optical Astronomical Observatory. "The idea is that the bigger the galaxy is, faster it is rotating," he wrote. "That means that if you know the rotation velocity of the spiral galaxy, you can tell by using this Tully-Fisher relation its intrinsic brightness (that is, how bright that galaxy really is). By comparing the intrinsic brightness with the apparent magnitude (what you actually observe -- because the further the galaxy, the dimmer it "appears"), you can calculate its distance." Telescopes that measure the cosmic microwave background – such as Planck – used another technique that examines fluctuations in the cosmic microwave background to determine the constant.